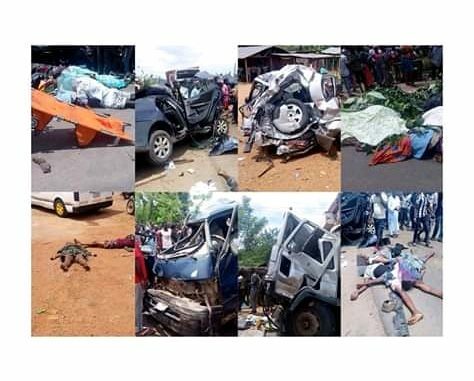 More than 25 people lost their lives, around 11:50am yesterday, after a truck rammed into 4 vehicles at a police checkpoint along Erin Ijesha-Akure road, Osun State. According a survivor, Prince Adegbite, 3 private cars and an 18-seater commercial bus were crushed by the beer truck, with about 25 people dying instantly. He claimed that a gridlock had formed as a result of the extortion activities of the policemen at the checkpoint, making it possible for the truck to crush the vehicles, after its driver lost control. He added that what baffled him most was that all the policemen fled, immediately the accident happened, and it was the civil defence, FRSC officials and some soldiers who came to help evacuate the victims.